This volume edited by Uwe Skoda and Birgit Lettmann is a significant contribution to understanding the visual media. It moves away from the approach taken by Gayatri Sinha in a previous book published in 2009 called Art and Visual Culture in India, 1857-2007 which primarily located visual culture within art and art history. Skoda and Lettmann’s edited volume ‘… aims to contribute to a more comprehensive anthropological, rather than art-historical mapping of contemporary empirical visual cultures in India…’. Given the broad scope of the work, Skoda and Lettmann identify the basis of their work in the ‘pictorial turn’ in the humanities and the social sciences as proposed by the American scholar WJT Mitchell in his seminal work Picture Theory first published in 1992. Borrowing from Mitchell they focus on the picture as an object of study rather than an object located within the disciplinary boundary of art history. The work does not remain limited within the object of the picture/image but rather looks at different kinds of optical appearances. In fact the book is divided into various sections according to the optical appearance that each of the contributed essays explore. Primarily in this case five parts have been looked at. They are camera works, folk/artistry, market signs, pictorial politics and monumental landscapes. However, these subdivisions within this book are not cursory, rather Skoda and Lettmann try to explore them conceptually within the interdisciplinary area of visual culture. Locating the use of photography in research in the nineteenth century, followed by ethnographic filmmaking, the book tries to understand concepts such as darshan as explored by Diana L Eck. Darshan as ritualistic visuality placed within everyday life becomes a methodological trope in understanding social processes. While talking about everyday visuality, Skoda and Lettmann explore concepts such as popular and the public borrowing from different theoretical pools. However, the book does not limit the usage of either of the concepts in the individual essays. Popular culture and/or public culture is then explored through the concept of memory and its manifestations or its triggers. Embodied memory and mediated memory, narrativization associated to such memory whether short lived or continuing to survive through generations is conceptually understood within the context of the image as also the statue. Skoda and Lettmann then move on to situating scopophilia as a psychoanalytical trope borrowing from Laura Mulvey whereby scopophilia can be understood both as sexual as also a manifestation of the ego dimension. The contributions in the book include Malavika Karlekar’s ‘ The Photograph in Social Science Research: A Few Ethical and Practical Questions’, Anusuya Kumar’s ‘Unlikely Devis: Gender and Imagination On and Off the Silver Screen’ and Uwe Skoda and Birgit Lettmann’s ‘Visualising Death and the Corpse: Perspectives on Post-mortem Photographs in Central Eastern India’ as the study of visual cultures related to camera work whether as still or moving images. The second section is a study of folk artistry through the study of contemporary Pata painting in Roma Chatterji’s essay ‘9/11 and the Folk Artists of Bengal’, the ritualistic practices around Sora paintings are explored in the essay ‘From Ritual Images to Animated Movies: The Transformative Journey of the Sora Paintings’ by Cecile Guillaume-Pey and Anjan Sen’s visual poetry is studied ‘in the context of traditional Indic culture, where historical, mythical and folk accounts are viewed as dialogical and fluid intersubjective and intercultural happenings’ in the essay ‘Anjan Sen’s Visual Poetry and the Bengal Uttar-Adhunik School’ written by Asuncion Lopez-Varela Azcarate. The third section looks at visual cultures of the market termed as the Market signs. Here the two essays included are ‘The Visual Culture of the Meat-shop Signs in Delhi’ by Rita Brara and ‘The imagery of Indian Matchmaking: Representations of Community, Class and Gender in a Transnational Online Matrimonial Market’ by Fritzi-Marie Titzmann. The fourth section ‘Pictorial Politics’ includes the essays ‘A Museum, a Memorial and a Martyr: Politics of Memory in the Sikh Golden Temple’ by Radhika Chopra, ‘Divine Order, Social Disorder: Debating the Visual Representations of Lalu Prasad Yadav’ by Ronie Parciack and Ilanit Loewy Shacham and ‘Amma Provides for All: Popular Devotional Aesthetics and Material Politics and the Amman in Tamil Nadu’ by Jill Reese. The final section ‘Monumental Landscapes’ include the essays ‘Building Monuments in a World Class City: Aesthetics and Politics of Contemporary Delhi’ by Sushmita Pati and ‘Mayawati’s Politics of Sthals: Spectacle of the Symbolic Landscape’ by Upasona Khound. Each of the essays conceptually revolve around Skoda and Lettmann’s initial exposition of concepts related to visuality. At the same time they broaden the paradigm of understanding the visual object reconfiguring the study of the visual, moving it out of the study of a mere aesthetic object to its everyday being. As a result the editors of the book are able to further the study to the several processes of image making or production of visual culture. However, in the book although these processes are discussed, they remain an underlying motif instead of becoming one of the significant perspectives in understanding visuality. In a study that consciously aims at an interdisciplinary approach to studying visual cultures, the lack of focus on processes, bodily aesthetics or soma-aesthetics in making them and performative aspects of the image/ visual culture is quite striking. One more interesting lack in the book is in its title, more precisely the subtitle of the book. 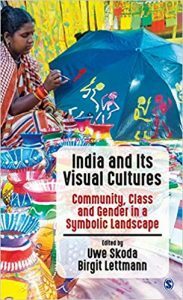 ‘Community, Class and Gender in A Symbolic Landscape’ curiously drops the word caste although contributions by Ronie Parciack and Ilanit Loewy Shacham or by Upasona Khound place the study not only within class and gender dynamics of visuality but also caste issues within symbolic ‘constructed’ ideas of a any landscape (in the case of this book the political territory of India). Sharmistha Saha is faculty at Department of Humanities and Social Sciences, IIT Bombay and specializes in Performance Studies.